Planning Emergency Supplies for Disaster Survival. Ignore people that claim you are paranoid because you are planning emergency supplies and a place of safety to survive a disaster, because in reality, current world events like natural and man made disasters are on the increase. It is wise to prepare for home evacuation which could be forced on you to survive disastrous hurricanes, wildfires, earthquakes, tornadoes or even terrorist acts. Arranging emergency supplies in alternative locations can ensure the survival of you and your family, and now is the time to have the foresight to prepare because during the chaos of disaster then it will seem as if the whole world around you is falling apart. You Could be Stuck in a Dangerous Survival Situation. Your family must be trained to know where the place of safety and meeting will be where you have stored your emergency supplies and survival gear. When disasters happen without warning, family members could be separated so plan some sort of communication system that the entire family and extended family are aware of. Many families have fortified cellars or even built bunkers to survive disasters but it may happen that these plans become compromised when your home is damaged in a disaster. It is sensible to have alternative locations where emergency supplies and shelter can be accessed in this case. Arranged dedicated safe zones where emergency supplies are stored, on site and off site to cover any eventuality. One of the most important survival gear pieces of equipment overlooked in emergency supplies is self defense because during chaos you will need to be able to protect your family. Invest in a firearm and learn how to use it to protect you and your family from criminal elements, or desperate refugees that may try and take your emergency supplies from you by force. With large scale disasters like earthquakes, floods, and tsunamis often causing major breakdown of utility supplies and infrastructure, your emergency supplies should contain sufficient long term storage foods to last at least 3 weeks or even longer. The most important supplies are water purification and food, followed by medical supplies and shelter. Although you have made adequate preparations in emergency supplies and have a good evacuation plan in place for your family go a step further and prepare them mentally. There are great guides and even survival games that will help your family learn what it takes to overcome trying conditions. Practicing evacuation drills and even surviving for a few days as if a disaster has really happened will make them strong and ready to survive when a real disaster happens. Discuss with extended family your emergency preparedness plans for survival and where to get to the emergency supplies and places of safety. It is important to be able to help each other and it begins with opening up lines of communication so that everyone is prepared. If you have had the foresight to prepare properly to survive any disaster then you are wise but go one step further to practice evacuation drills and periodically check the integrity of your emergency supplies at all locations. Keep records of long term storage food expiry dates, water supplies and other gear so that you have peace of mind that you are ready to survive any catastrophic disaster whether natural or manmade. 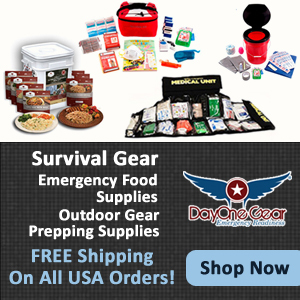 As technology improves with newer state of the art survival gear you can further add these items to your emergency supplies as time goes on too.